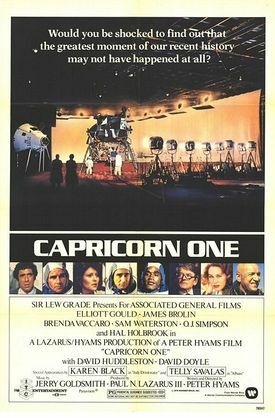 Capricorn One theatrical movie poster. NASA feigns a Mars landing using a real (empty) space shuttle, Capricorn One, sent into space, and its three astronauts, Brubaker, Willis and Walker, filmed on a soundstage at an Air Force base. When the shuttle burns up on re-entry, Brubaker and his men, realizing now NASA will have to produce three corpses to make the hoax complete, escape from the base and are pursued by the government that betrayed them. One of the numerous models seen throughout the movie. NASA helicopter which flies the astronauts to the airstrip after their removal from the shuttle prior to liftoff. NASA jet which flies Brubaker and the others to the top secret desert hangar where they stage the fake Mars landing. Later, they escape in it, but it runs out of fuel over the desert and crashlands. In the background, under the landing gear of the helicopter, a North American F-100F Super Sabre with the special paint scheme of Flight Systems Inc.
Archive footage of the USS Oriskany (CV-34) as the Panther was retired from the US Navy in 1958. Probably the same shot seen in The Bridges at Toko-Ri. On the USS Oriskany (CV-34). The Banshee has been phased out in the beginning of the sixties, so it's an archive footage or re-use of a scene from The Bridges at Toko-Ri. At far right, F2H Banshee with wings up. These two helicopters are sent to track down Brubaker, Willis and Walker. The behave eerily like living things despite being piloted by people, as they often stop and turn to face one another as though conversing. Both crash into a cliff during the final chase sequence. Caulfield rents this biplane from a crazy pilot named Albain, and the pair use it to find and rescue Brubaker. The Hughes helicopters pursue it, but Albain outflies the Army pilots and the trio escape. This page was last modified on 23 January 2015, at 15:46.